Based on information made public by the US Department of Defense through its website as of September 29, 2016, the US Navy's Naval Surface Warfare Center awarded a US$25.4 million contract to BAE Systems Land & Armaments LP for the production of Mk. 38 Mod. 3 Machine Gun System (MGS), which will be installed on US Navy ships as well as Foreign Military Sales (FMS) to friendly countries. Among those scheduled to receive from FMS is the Philippine Navy, whose share on the contract is around 8%, or roughly US$2.03 million. This is in addition to an earlier contract, which the US Navy's Naval Surface Warfare Center also awarded to BAE Systems Land & Armaments LP in October 2015 for US$30.556 million, wherein the Philippine Navy shares around 6.24% of the contract amount. The Mk. 38 Mod. 3 MGS with a 30mm ATK cannon. 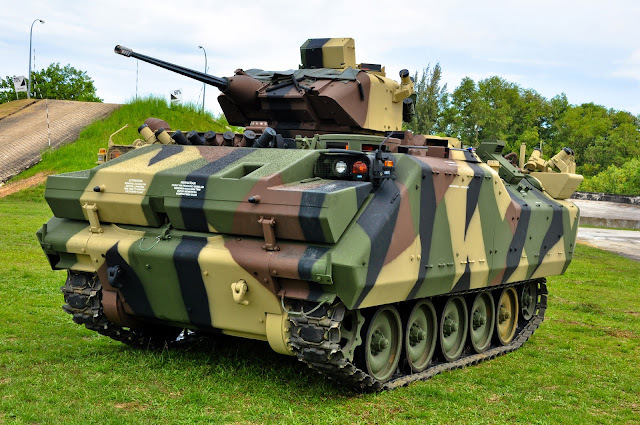 The Philippine Navy opted to use the 25mm M242 Bushmaster cannon instead, based on the DoD's information. Based on previous information gathered by MaxDefense Philippines using publicly available sources and confirmation from our sources, a Mk. 38 Mod. 3 system costs a little less than US$1 million as of mid 2016. Thus it would be safe to assume that in each of the two contracts, the Philippine Navy stands to get two (2) brand new Mk. 38 Mod. 3 MGS, for a total of four (4) systems. Each DPCF are expected to have two (2) Mk.38 guns, one each on its port and starboard sides in the midship. The photo above shows the Mk.38 Mod.2 of the BRP Ramon Alcaraz. Photo taken from the former Timawa.net forum c/o geminirecon. MaxDefense sources previously confirmed that the machine gun systems covered by the 2015 contract was meant to be installed on the Del Pilar-class frigate (DPCF) BRP Gregorio del Pilar (FF-15), so it is highly possible that the MGS covered by the 2016 contract was meant for the only other DPCF left without an allocation, the BRP Andres Bonifacio (FF-17). But MaxDefense would still put some caution on this information. 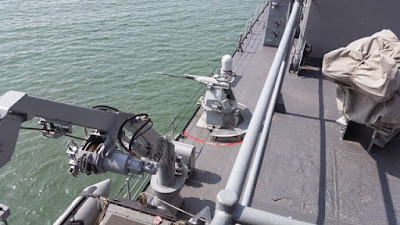 Currently, aside from the DPCFs, the Tarlac-class Landing Platform Docks are also in need for self-defense weapon systems to defend itself from fast moving surface threats and slow moving aircraft. Also, based on the acquisition plans of the Philippine Navy for the LPD's weapon systems, they are also recommending the acquisition of MGS systems like the Mk. 38 Mod. 3 for the class, at least two (2) units for each ship. It now boils down to the latest threat assessments made by the Philippine Navy. Which ships are in need of these Mk. 38s first? While MaxDefense has no information yet on that, the possibility of the Philippine Navy making changes on the installation plans is present. So while we can assume that the four upcoming Mk. 38 Mod. 3 MGS are for the the FF-15 and FF-17, this is not yet 100% final. 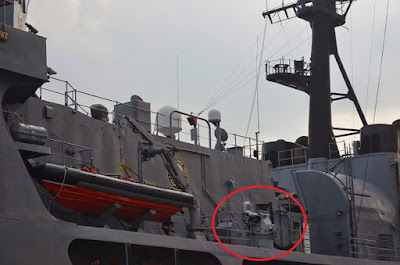 Despite being in service and used in naval operations for several months now, the BRP Tarlac (LD-601) still do not have any of its planned weapon systems. The PN decided to go for a "Fitted For But Not With" (FFBNW) scheme with the Tarlac-class, so it is highly possible that the Mk.38 Mod.3 might find its way to the LPDs if the PN decides so. Currently the only ship in the Philippine Navy armed with the Mk. 38 Mod. 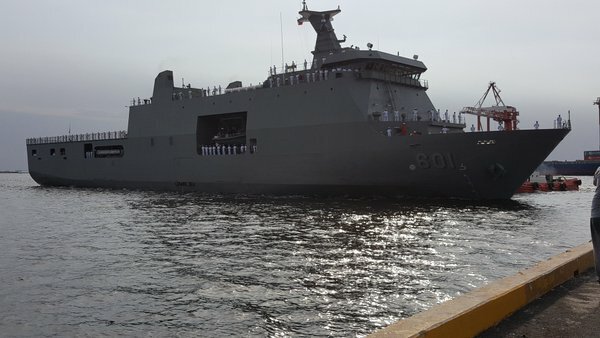 2 is the DPCF BRP Ramon Alcaraz (FF-16), which received its MGS in late 2014. The Philippine Navy also has several Mk. 38 Mod. 1 units, which are not remote-operated systems. The Mk. 38 Mod. 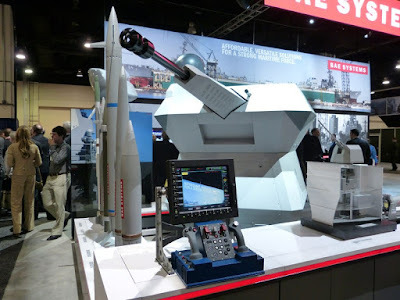 3 is a newer product, developed by Rafael Advance Defense Systems Ltd. of Israel, for BAE Systems. Both the Mod. 2 and Mod. 3 variants are based on Rafael's Typhoon weapons station, and are capable of remote operation from inside the ship. The Mod. 3 variant also has a co-axial .50 caliber M2 heavy machine gun. It also holds 3 times more ammunition than the Mod. 2 (500+ vs 165 25mm ammo), has a stealth cupola that doubles as protection from weather, and also has improved accessibility to internal components for maintenance. The Mod. 3 also allows for a greater range elevation than the Mod. 2 (-20 to +70 degrees vs -20 to +40 degrees), improving its capability to shoot slow moving aerial threats like helicopters and drones. Port side of BRP Ramon Alcaraz (FF-16) showing one of its Mk.38 Mod.2 MGS. Photo taken by a MaxDefense community member who wished to remain anonymous. The Mk. 38 Mod. 3 covered by the 2015 contract is expected to complete the delivery to all end users by April 2017, while those covered by the 2016 contract has a delivery completion deadline by May 2018. MaxDefense sources confirmed that the Philippine Navy will be getting theirs sometime near those dates, so MaxDefense is expecting 2 units delivered probably by this month or next month, as covered by the 2015 contract. More information will be provided by MaxDefense as the project progresses. So this will be the standard ciws for PH navy. How about jacinto class ships, is there a plan to put this weapon system? Question Mr Max. 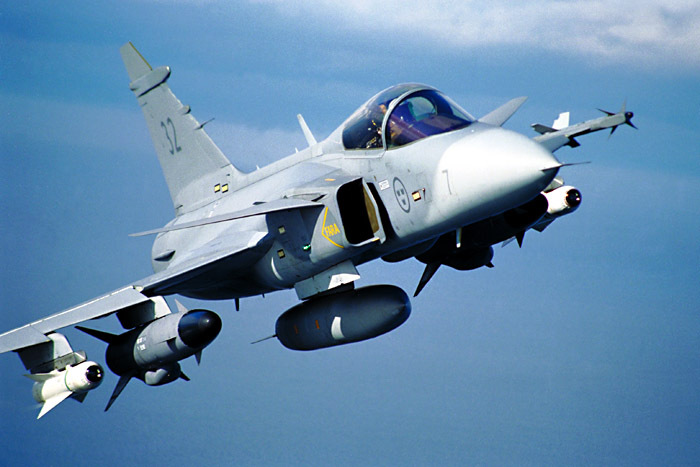 Why Indonesians was able to hold and investigate an airforce pilot from other country who enters in indonesia air space while our Navy was not able to enforce our laws and practice our rights whenever other country enters into our territory like Benham rise? Are we just stupid, coward or over diplomatic? hmm till now max defense still not covered ASEAN/Aspac militaries development as you did in the past, what a let down actually. Hi Sir Maxx.. that's a good news particularly for BRP TARLAC with no capable weaponry in his defense..
Sir...off topic. I wanted to ask if the PH navy now has a shop list for type of submarines? Saab company reportedly set up an office in Ph and they have thes A26 submarine which I think fits the PH requirement. It is quiet alledgedly sneek past the US aircraft carrier fleet and defeated submarines from spain and france during naval exercises. I think its not really expensive for a small to medium sized sub. Also any update on the notice to proceed for anti sub helos? Wat happened to the acquisition of wildcats? Hopefully the fresh tirade of PDU30 against US would not somehow affect this endeavor. You mentioned about the proposed plan of the PN to have a anti-ship missile capability to be installed on one of the GDP class. Are they inclined on the SSM-700K Haeseong (C-Star) Anti-ship Missile which would be use for the future frigate or would it be another? The Navy isn't a stranger to 30mm ammunition, if I recall. At one point, the fast attack crafts were equipped with the Emerlec twin 30mm autocannons, which have long been decommissioned. Maybe they can consider adopting 30mm ammo to give the ships a more powerful punch.